Sponsored Content: This video contains paid product placement. Thank you to Titan Compression for sponsoring this video and providing Doctor Jo with frww compression knee sleeves to use. 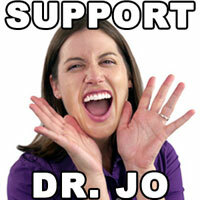 If you purchase this product from these links/ads, Doctor Jo will receive a commission. Click here and use discount code 6DQT-CK66DA-6B7RPB to get 10% off a pair of Titan Compression Knee Sleeves. These knee strengthening exercises don't require using a lot of weights. If you have some knee pain, you might want to use knee compression sleeves. They can help reduce swelling, pain, and give your knee some compression during the exercises while helping the healing process. In this video, I'm using Titan Compression Sleeves. The first exercise to help strengthen the knee is a short arc quad (SAQ), this is a great way to get started without doing to much to the knee. It helps strengthen the quad muscles with extend or straighten the knee. The next knee strengthening exercises are a bridging series including a regular bridge, bridging with a band, and bridging squeezing into a ball. These all are great for the hamstrings, glutes, and surrounding muscles of the knee and hips. Then you will do a long arc quad (LAQ), this is like the SAQ, but it is a longer arch with works the quad muscles in a bigger range of motion. The final two exercises for the knee are a squat and a squat with a band. Squats do a great job of strengthen all of the lower leg muscles including hamstrings, quads, glutes, hip flexors, and others.